Canine Light Therapy Helps with Dog Arthritis and Joint Pain. Canine Light Therapy Pads Are Effective - Yes, they really work. There are over 1000 independent research studies that prove light therapy is helpful for a wide variety of medical conditions. You can scroll down and find links to two studies that show light therapy will provide pain relief and reduce joint inflammation caused by Arthritis. 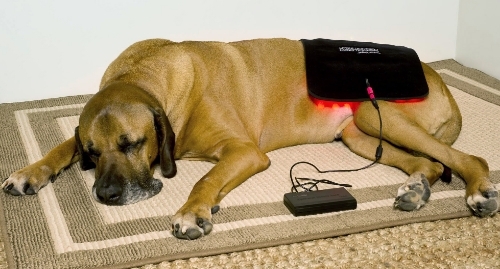 Canine Light Therapy pads provide the same deep-red and near-infrared energy that are used in the studies. Canine Light Therapy pads provide that same kind of pain relief and reduced inflammation found in the studies; just look at the two happy customers below. Canine Light Therapy Pads Are Affordable - Canine Light Therapy pads cost much less than lasers or even a regimen of laser treatments. A laser will cost you several thousand dollars; laser treatments cost $50 to $100 each and a typical regimen is once or twice per week. The Canine Light Therapy pads start at a couple hundred dollars and will provide thousands of treatments. Canine Light Therapy Pads Are Easy to Use - Just lay the Canine Light Therapy pad on your dog or wrap it around the leg and plug it in. There are no settings, dials, or switches. The pad will shut off automatically after the full treatment time of 15 minutes. Then simply remove the pad and unplug it. It is just that easy; anyone can do it. Canine Light Therapy Pads Are Convenient - Use Canine Light Therapy pads at home; it simply can't be more convenient. There is no need to load your dog into the car, drive to the laser treatment, wait your turn, pay for the treatment, load your dog back in the car and drive home. Just use your Canine Light Therapy pad at home where your dog is more relaxed, more comfortable, and you can avoid the extra stress on the joints caused by getting in and out of the car. Canine Light Therapy Pads Are Safe - Canine Light Therapy pads are very powerful but very safe. You do NOT need safety goggles or special training that you would need with lasers. An improperly used laser can damage tissue or delay the healing process in what is called the "laser inhibition response". Canine Light Therapy pads will not damage tissue and there is NO risk of the "laser inhibition response".